If you watch a lot of true-crime TV or are a fan of shows like CSI:, then you’ve heard of DNA. (If you haven’t, you might want to read up on it.) The only reason I bring up DNA is because of its structure, which is that of a double helix. So, what’s a helix? 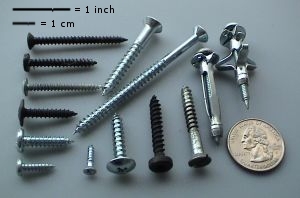 It’s a screw. Seriously, if you were to unwind the threads of a screw, you’d find you had an inclined plane on your hands. The inclined plane is wrapped around the core of the screw, creating a helix. A more common term for a helix is a spiral, as in “spiral notebook,” one in which the pages are held together by a wire spiral. I’m not sure if I knew what a helix is before now or not but I do not what a spiral is and I remember quite well the Spiral Staircase’s big hit. Happy a2zing! Miracles like the coded DNA in living organism make the existence of God all the more real–at least to me. Before we got married, when my wife and I were still in the stages of courtship, I used to sing “I Love You More Today Then Yesterday” to her over the phone sometimes. Having grown up in Ecuador she was unfamiliar with the song, but tickled by the sentiment. Love the word and your definition which I never thought of the DNA helix as a screw but that works so well and same with the spiral. I know that song so well but never knew the band. They were a one-hit wonder, so it’s no surprise you don’t remember the band. Good song, though. Some things in the Bible got lost in translation, as the word ‘Rib’ is not a rib at all. A better translation would have shown that Adam’s rib was a curve which could be represented by the DNA double helix. Oh man! Those coordinated outfits are straight almost a decade out of order. I like the song, but really had to stop watching the video. Started laughing too hard. Don’t forget all the Spiral Staircases in horror/thriller films. That’s a good oldie. Ten years ahead of its time, I think. Very good, John. My dad gave my mom a charm for her bracelet that said “I love you more today than yesterday, less than tomorrow” written in Italian. Your post was kind of a helix as it spiraled from point to point. 🙂 We’re doing this thing! It was written stream of consciousness-like. Glad you liked it. Interesting… I’ll have to look into Flume some more. You’re making me realize how brilliant your choice for A-Z is! I thought it would be so much harder! Actually, it was very easy, with the help of a few online word generators. About half the words have changed from my original list, which is par for the course. I am picking random sites to visit since it is really difficult to get to everyone. Interesting choice of words for the atoz challenge today. All the best with the rest of the month! That’s a good way to get through the visiting part of A to Z, aside from visiting the people who visited you. Good luck to you!